I have 2014 Mazda 6 GT without ELoop with 23k miles. I replaced the drive belt tensioner because it was leaking oil. By the time I noticed it had already leaked a lot of oil all over the place. In fact the alternator is a little bit black on the top. After replacing the tensioner I cleaned up the oil from all the surfaces except from the alternator. (I didn't want to mess it up in any way). Everything, appears to work fine but out of curiosity I measured the voltage on the battery with the car running. On IDLE I get 13.80 Volts. It seems to me that 13.80 is a little low. Anybody with a 2014 Mazda6 that has measured the battery voltage recently? Does it seem normal? The reason I'm concerned about this is due to the oil leak on top of the alternator... What do you guys think? I remember measuring the voltage at the battery terminals while the engine is running and if I remember it correctly, I got 14 or so. I'll measure it this afternoon. By the way, I have the 2018 model but I don't think it will be different from yours. Anyways, let's wait for the opinions of our expert members. Thanks for the data point! I get 13.97V when I first start the car and the engine is working at higher RPMs. 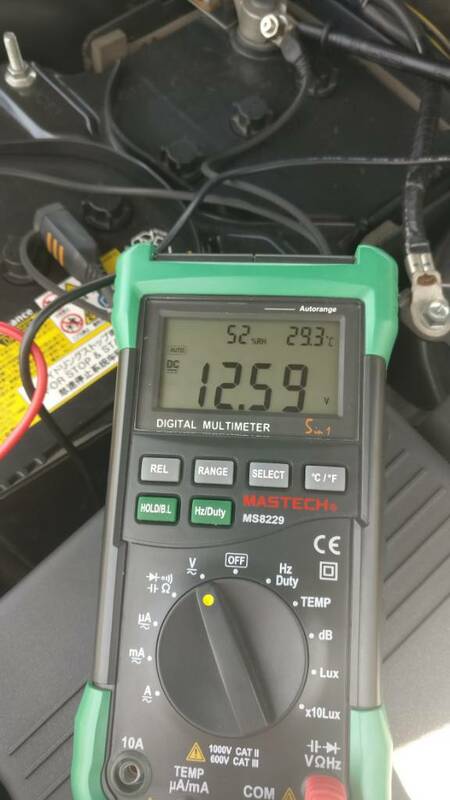 If I let it warm up and then idle the voltage sits at 13.80V. Since I was waiting for lunch, I decided to go down our ship and measure the voltage. Take note that I am measuring from the battery terminal and not directly to the alternator. From what I know, the alternator is giving about 17 volts and regulated down to 13.8 volts. From the battery terminal before starting, I got 12.6 volts. Cranking voltage is about 10.8 volts then it was steady at 13.6 volts. I made a video but I don't know how to upload. Just trust me on these values. If I may add, and if I'm not mistaken, when cranking voltage goes below 9 volts that means to say your battery is no longer good. Of course, a battery tester is the still the best way to know the health of your battery. So to answer your question, I think you have a good voltage reading. tlogic and idrive like this. And well within the parameters of a healthy alternator. Thanks Archerfish, idrive! At least I know my alternator is not failing. I would still like to clean the oil on top of it. I was thinking of spraying a bit of electric parts cleaner (https://www.crcindustries.com/produc...-oz-05018.html) on a rug and then gently wiping the oil from the top. Do you think it's a bad idea? Maybe I shouldn't touch it since it's working properly. I have a 2016 Sport it showed 13.7 after replacing with new battery.